See TranslationTeam to support our translation effort! If you want to participate in the overall project, add your name to the "*Participants*" field in the form. Read TranslationUserInterface for further information about how to participate in. For (1) a solution has to be built, which will extend the translation to existing extensions and will handle translation work on a proper webbased platform. 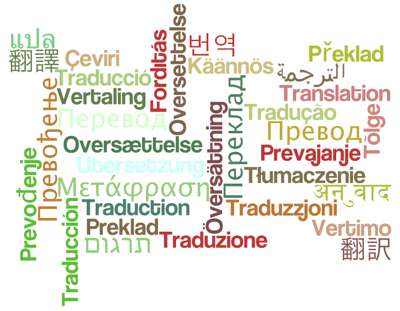 Having extensions translated will generate a great impact on our translation effort. For (2) the documentation should first be written properly, before it got translated to 12+ languages. It would be good to include the TranslationTaskTeam in this team too, as they will have an influence on how documents are worded. Defining terms - and with that I refer to terms that for normal users are simple and easy to remember and still go straight to the point. There were long discussions whether a page is a topic or a topic a page, but let's keep it simple: By the end of the day, the user will see a web page in his browser. So without wanting to start this discussion again, I believe that everything, that has to do with how to call the different elements of this wiki, should be defined once and after that never again. Having the terms defined and having them simple, the translation will be simple. Staying with the example of topic and page: It is simple in English, but may be complicated in other languages because the difference between the word topic and page is semantically not necessarily the same. This done, all documentation must be revised and the terms must be substituted accordingly. I think this will be the first big task for this team. If the content of the documentation can be updated during the same step, even better. The updated version of the documentation has to be frozen so that translation can start. And yes, translation is very important to spread this wiki. Although english is standard for everything that has to do with IT, reading a manual in her/his own language is still the most comfortable. Besides, the administrator might be used to read documentation in english, but the end user definitively not. When changes on the core documentation are made, a mechanism has to be found so that updating the translations is easy. Presently, it is a p*** because one has to go through each line of the original document, make sure that the translation is still ok and figure out, where something changed (maybe just one sentence). And if it is a long document, good luck Version comparison is only of little help, because translations are not literal. So maybe what is standing at the beginning of a sentence in English, might be at the end of the sentence in Spanish or German. There should be a kind of index that indicates if an original core document has already been translated (or not) and to which languages, and if an update of the translated documents is required because the the core document was updated. Documents that have no translation should refer back to the original (English) document. But that's more a task for the TranslationTeam. [...] Has something like Google Translate been considered to assist in automating some of the translation? Probably it would not give a very polished translation, but the places it would have difficulty might be somewhat predictable, so that a second stage of processing could be done in Perl, followed by a final proof-reading by a human fluent in the language. Special note: Can you separate pt-br from pt-pt on the translators list? In order to I add myself? Hey Will, in fact it should be ES_CR I just seperated it, but at the same time, I started to doubt if it makes sense. Obviously, there are (important?) regional differences that affect the translation of a string. On the other hand, we will start sharing resources. If there were four translators for Spanish, suddenly there might be only one or two for a Spanish subgroup. So? "Foswiki is a free wiki that is based on open source"
"Foswiki is a wiki that is based on free and open source"
I know it's a subtle difference, but hopefully someone knows what we want to communicate to potential users. Kan man inte säger: "Foswiki - det frit och öppet source wiki"? I think every language will have some speciality in it. Yesterday we talked about if Foswiki is male or female I like your suggestion to have a special page where we define a bit more the character of Foswiki and build up a common sense. This also could give orientation for new translations and translators. Great, I see that you know some Swedish. Your suggestion isn't entirely gramatically correct, however. The phrase "free and open source" translates to "fri och öppen källkod", but it's impossible to cram the word "wiki" into the phrase in Swedish. I'm not a grammar expert, but it probably has to do with the fact that "open source" is used as an adjective in English without actually being an adjective. For now I'll settle for the translation "den fria wikin baserad på öppen källkod" which conveys both that the wiki (i.e. the software) is free and that its source is open. Do we use formal or informal language? Is there already some agreement about that in the community? I propose keeping the formal languages as minimum standard for the releases of foswiki, but to use informal language in the international webs on foswiki.org. Have you ever thought about putting Foswiki to BetaWiki for translation? The use of MAKETEXT is OK when we want an international site with many languages. But in most corporate contexts this is not the case. Intranets are almost always in a single local language, so the constant use of the translation function is a performance loss with no benefits at all. If Foswiki is supposed to be oriented to enterprise environment an alternative way of translation should be provided. I think fully translated templates can be a better choice in the case the use of only one language is needed. The multi-language options must exist too but this option of only one language is also necessary. A way to achieve this can be the development of a script to replace MAKETEXT functions in the templates using the information in the .po files. In TWiki If I need a single language Intranet I have to modify the templates to remove the language bar. This could be fixed in Foswiki defining it from configure script. Maybe just defining only one language in locales options the bar is removed. That case English should not be forced if it is no needed. I have used fully translated templates in two Spanish language Intranets with good results for two years so I think both translation approaches should be provided in the site to be downloaded with every version. I would also be glad to collaborate in this effort. This sounds like a good idea. The fully translated templates could be organized in subfolders, one folder per langauge. The interface translation is just one aspect of I8N. What about the content? Do you have ideas for the proper organization/structure of a Wiki site with content in multiple languages? How would we do this using Foswiki? No, I have no too much experience working with multi language environments. Besides I have not seen too much effort put on the translation of the content. In current .po files the translated context is minimal. In the sites I have used in Spanish I have found almost mandatory to translate the welcome page, the tutorials and the help pages. I had to translate also all the topics of the _default web. I think the rest of the default content is mostly administrative, so the ability to read it could be included in the AdminSkillsAssumptions. Question from the association board - is the work of this task team now complete? The target completion date has been passed. If not, you may want to revisit your goals. BTW I changed your status to "running" as you have been de facto for a long time now. Andre, can we have a status update please? Hi, I am new user, we will start using FosWiki at our organisation. I started to Turkish translations. I am planning to finish translation of mostly used parts at the end of april. I registered at translate.foswiki.org with username yamant. How can i add Turkish Language to translate.foswiki.org ? that's great news! thanks! i've created Tasks.Item8854 to work on this and started the process. Maybe someone can shed some light in here: Are we still working with the *.po files. Or only with the pottle server? From the programmers' side, are the *.po files enough or is also translation of core documentation intended / required? If it is, how will this implementation take place? In seperate webs for each language. Or some big MAKETEXT chunks? A translation of all documentation is not planned yet. The original documentation has to be streamlined in advanced, before it will be translated into 20 languages. IMHO 3 documents which cover the most central aspects would be enough for the start. The information around translating Foswiki is heavily outdated. For instance, TranslationUserInterface doesn't even mention translate.foswiki.org. Could you as a team create a better entry point for new translators? This team is in need of a new team lead as Andre hasn't been seen on the project for a long time. Andre, are you still available? Or anybody else on the list: please step forward to take the lead. Thanks. ReleaseTaskTeam: translation activities as part of a Foswiki release. If you are an active contributor to this task team, please join one of these two projects as a participant. May I suggest another language to be added? I know not many people do really use that language, but since I'm working on a Wiki about the klingon language, people hav asked me to set the interface to use klingon. Topic revision: r42 - 28 Apr 2015, LieVen - This page was cached on 23 Apr 2019 - 13:25.